Kershaw Natrix CF 7007CF. 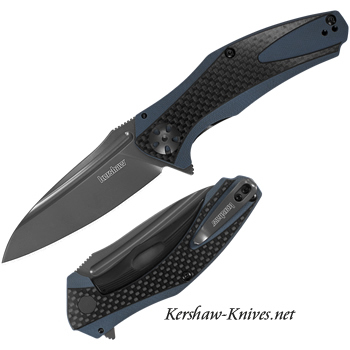 Kershaw has made a line of Natrix, this is the one with a blue handle and carbon fiber overlays on the handle. Styled after the Zero Tolerance 0770, the Natrix has naturally been in big demand. It has a deep blue-gray colored handle that has 3-D machined G-10 scales with classy carbon fiber overlays on front and back of knife. Blade is made with 8Cr13Mov steel that has gray titanium carbo-nitiride coating and is 3.25 inches long. Opens with a flipper and the KVT ball-bearing opening system. Has a sub-frame lock system as well. Deep carry pocket clip that can be changed from left to right in the tip up position. Handle is 4.25 inches long and weighs 2.9 ounces. Stylish and sleek, the Natrix CF 7007CF is perfect.